IceChipsFun.com: Win An Hawaiian Family Adventure! 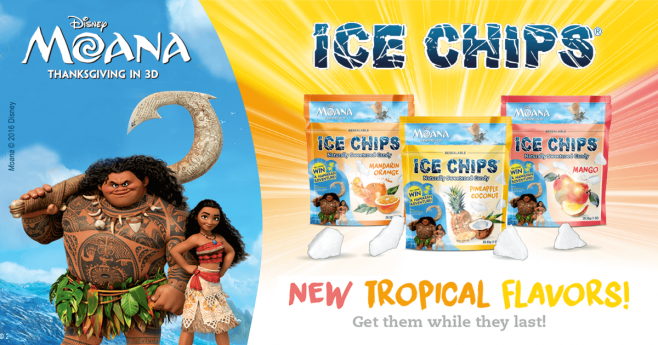 Ice Chips Candy recently introduced explosive new flavors inspired by Disney’s Moana. To celebrate both the release of the movie and the new tropical flavors, you are invited to enter the Ice Chips Hawaiian Family Adventure Sweepstakes. Enter daily through December 31st at IceChipsFun.com. You could win an Hawaiian adventure for you and your family where you’ll have the opportunity to enjoy a Jungle Adventure at Kualoa Ranch, Guided Shark Dive, 3-hour cruise and more. The Ice Chips Hawaiian Family Adventure Sweepstakes is open to legal residents of the 50 United States and the District of Columbia, 21 years of age or older as of date of entry. Begins November 1, 2016 at 12:00:01 a.m. PT and ends December 31, 2016 at 11:59:59 p.m. PT. Limit one Entry per person, per email address, per day. Grand Prize winner will be selected in a random drawing on or about January 5, 2017, from among all eligible Entries received during the Sweepstakes Period. The approximate retail value of the Grand Prize is up to $10,862. Sponsored by Ice Chips Candy LLC, 818A 79th Ave SE, Olympia, WA 98501. Administrated by Don Jagoda Associates, Inc., 100 Marcus Drive, Melville, NY 11747.
a Sponsor-specified Hawaii 3-hour cruise. During the Sweepstakes Period, you may enter the Ice Chips Hawaiian Family Adventure Sweepstakes at www.IceChipsFun.com and complete all required registration information such as your full name, complete mailing address, email address, phone number, and date of birth. Entries must be completed and submitted by 11:59:59 p.m. PT on December 31, 2016 to be eligible. For complete details, including Official Rules, visit www.IceChipsFun.com. This is very exciting. Would love to visit Hawaii for it beauty, culture, as well as her diversities. I’m older lady but love animation show . Would love 2 visit Hawaii…good luck 2 all who enter…1 of us has 2 win. A safe & happy holiday 2 all.